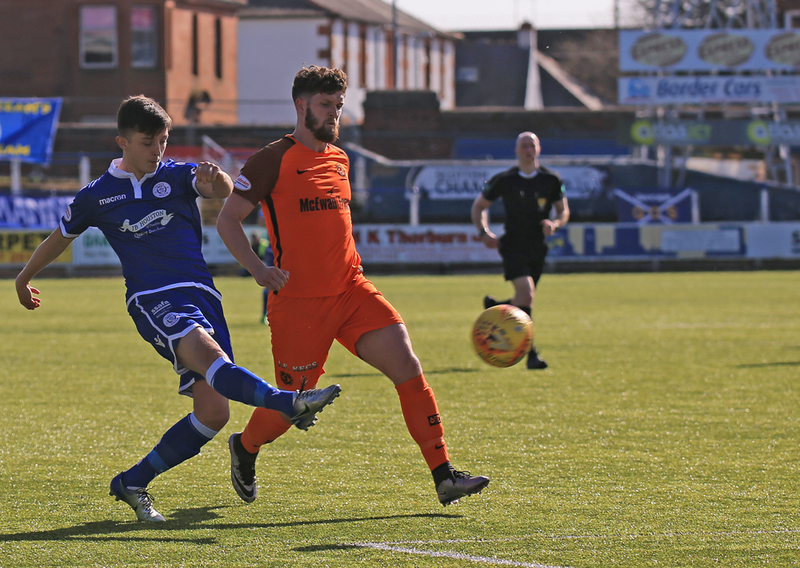 Well it finally happened, no not two consecutive days of sunshine in Dumfries, but at long last a home win for Queens as they concluded what has been a frustrating 2017-18 home campaign with a thoroughly deserved win over play-off chasing Dundee United. The 3-0 scoreline could have been worse for a visiting team who looked lacking in most departments, and Queens with no pressure on them, eased to a very comfortable win. 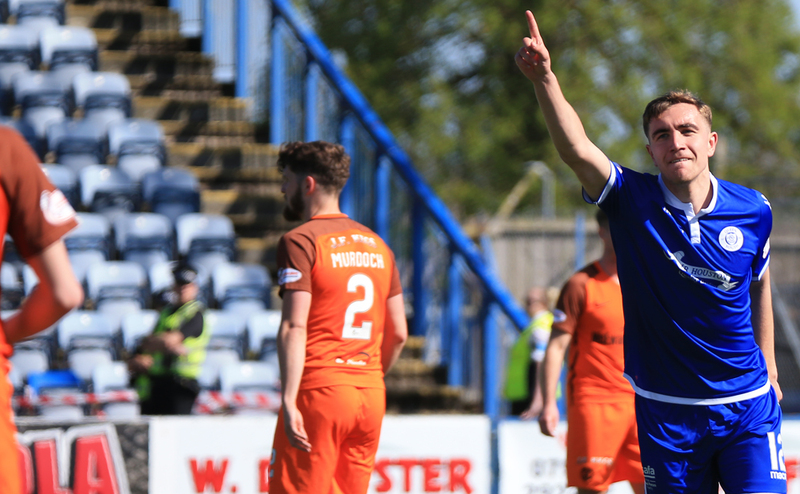 Prior to kick-off various supporters associations presented their player of the year awards, where Lyndon Dykes, and Stephen Dobbie claimed just about everything going. 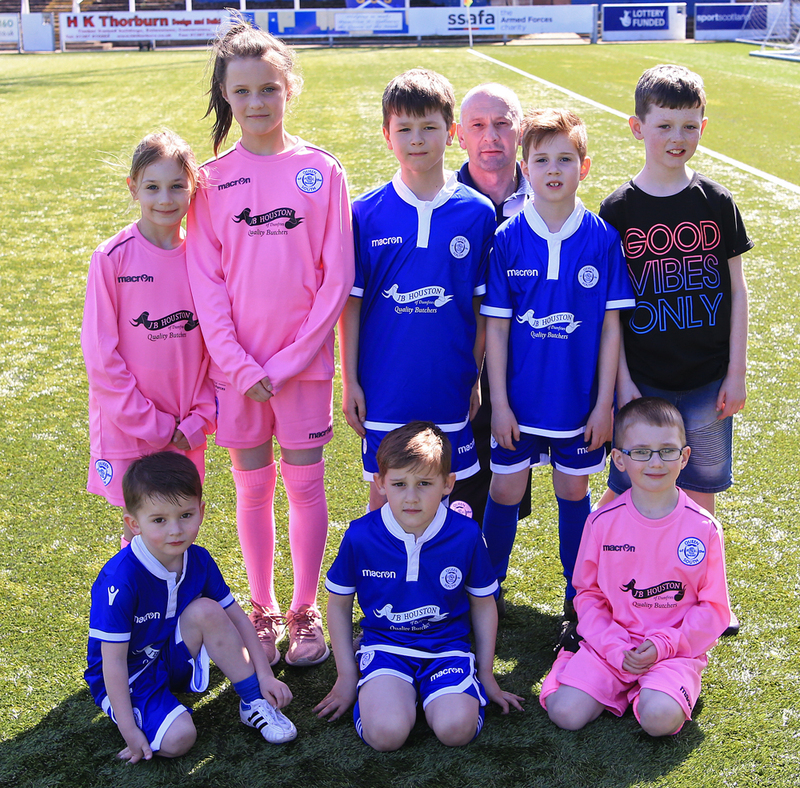 Jack Leighfield was the only change made to the team that started at Morton last time out,with Owen Bell returning to the match day squad following injury and with the sun beaming all around Palmerston, Queens lined up in a 4-4-2 formation. 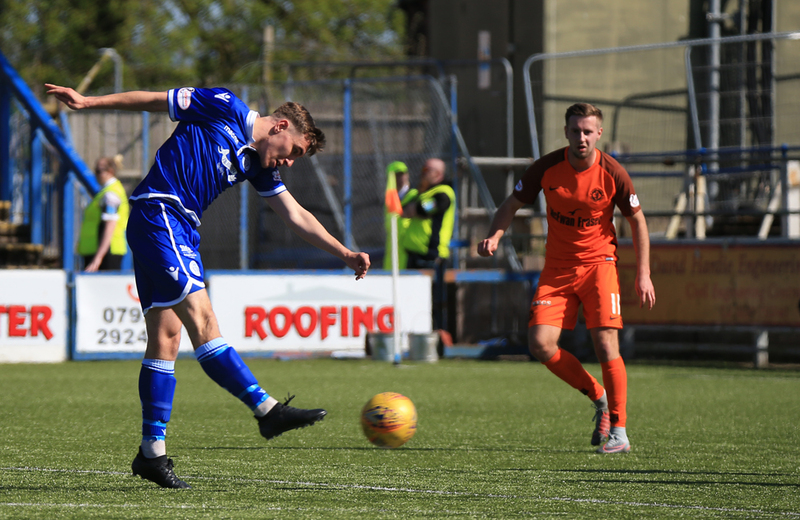 The hosts almost got off to the best possible start when good work from Lyndon Dykes created an opening for Stephen Dobbie, but his shot lacked power and the ball ran through to the `keeper. Queens continued their bright start to the game and after turning past a defender, Dom Thomas fired a shot well wide. 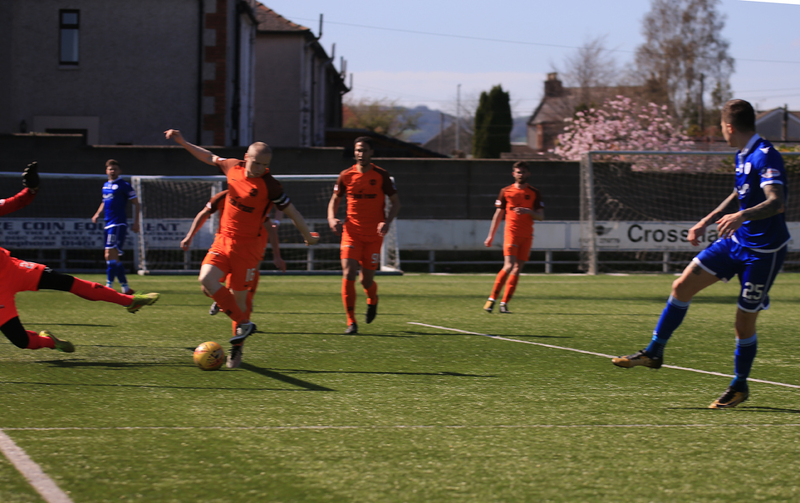 The opening goal should really have arrived as early as the fifth minute when following Queens` first corner of the game, Thomas` delivery found it`s way to the unmarked Darren Brownlie at the back post, but he could only direct his header straight into the hands of the grateful Mehmet. As was pre-planned, on the 9th minute, and with Derek Lyle sent out to `warm` up, the Queens fans started their minutes applause to show their appreciation for the striker, but what was not in the script was the fact that Queens would take the lead during this minute. With most people looking towards Lyle as he ran along by the main stand,and then along the Portland Drive end, a cross into the Dundee United penalty area fell kindly for Lyndon Dykes to tap the ball home from close range. The away side were content to knock the ball around from side to side and back to front etc.. but it wasn`t troubling the Queens defence at all, and the more direct approach from Queens was certainly paying dividends early on. Their was an opportunity for Queens to increase their lead when Dobbie`s pass picked out the run of Dykes, but the `keeper was smartly off his line to clear the danger. 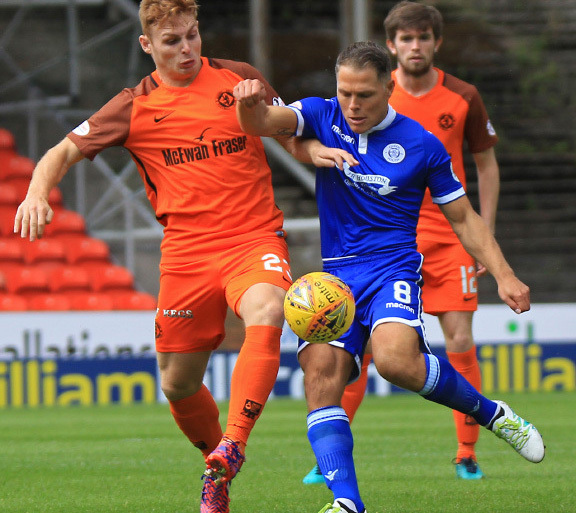 The visitors then forced a couple of corners in quick succession which caused some panic in the Queens defence, but the move was ended when Mohsni was penalised for a high boot as he challenged Callum Fordyce. The Queens midfield were working hard, and the central pairing of Jacobs and Thomson were just about in control of that area forcing Dundee United to start their attacks from deep, which allowed Queens more freedom and space. Stephen Dobbie almost added a second goal on 20 minutes after Josh Todd had robbed Flood, and then Kyle Jacobs was well off target after he got the break of the ball just outside the penalty box. A snap shot from Scott McDonald from all of 30-yards failed to worry Leighfield, and just past the half an hour mark, Queens extended their lead. Dom Thomas gained possession and fed Dobbie who broke clear down the right and when his low cross was only partially cleared, it fell to Joe Thomson, who turned and shot and with the help of a slight deflection the ball slipped past the stranded `keeper scoring his 5th goal in 7 games. The goal was no more than Queens deserved as they were well in control, but it did finally stir the visitors into something of a response, and good work from McDonald set up a chance for King, but his attempt flew well wide of the target. The same player went much closer minutes later when his powerful drive caused Leighfield to make a decent save, and then Ralston`s break forward ended with him shooting well over after he had worked a good opportunity for himself. Those few attempts in quick succession were all that the away team could really put together and the half ended with Queens well in control. The visitors made a change at the break when Lyng replaced McMullan, and in fairness to them, they made the better start to the half and an early corner saw them go close when Mikkelsen rose highest of all but couldn`t control his header. A quick break down the left involving Todd, and then Marshall set up a chance for Thomson, but his aim was well off target. Just around the hour mark came a big chance to really seal the game. Dobbie`s floated ball through the middle picked out the run of Dykes and after an excellent first touch had set him up to shoot, the Queens striker was unlucky to see his effort well blocked by `keeper Mehmet. A quickly taken throw-in that found Dobbie almost led to another Queens goal, as after slipping past defender Ralston, Dobbie`s curled effort just slipped wide of the far upright. The first yellow card of the game was shown to Scott Mercer for a rather robust challenge on substitute Fraser, and a few minutes later Thomas was also cautioned after he was guilty of a spot of shirt pulling. There were strong appeals for a penalty from the travelling support as Brownlie challenged McDonald, but the referee remained unmoved and nothing was given. The away team were handed a decent chance to drag themselves back into the game on 73 minutes when Kyle Jacobs conceded a free-kick just over 20-yards out, but from a central position, Fraser`s bending effort went well wide. With 15 minutes remaining Connor Murray replaced Dom Thomas, and what happened next will remain with young Connor for the rest of his days. Wide on the right and some 25-yards from goal, as the ball set up nicely for him and with his first touch of the game, Connor Murray thumped the ball past Mehmet to score his first senior goal - what a way to score your first goal !! With the points in the bag, and at last a long overdue home win now certain, the only thing left to mark the day would be the appearance of Derek Lyle, and with 10 minutes remaining, Lyle replaced Dobbie taking the captain`s armband in the process. Sadly there was to be no fairy tale final Palmerston goal for the `Tan Man`, but at least he ended up on the winning side. Shaun Rooney replaced Josh Todd for the final few minutes during which time McDonald hit the bar, Jordan Marshall was booked for wasting time, and Jack Leighfield produced an excellent block when he saved Lyng`s effort to help Queens to keep a second consecutive clean sheet. So the home league campaign ended the same way as it had started, with a win, just a shame that between both games some of the home performances were really pretty disappointing, and so as one season draws to an end, it`s not really too long until it all starts again and with the next season being a big one as far as Queen of the South is concerned, hopefully it can be more successful. Enjoy the break. 1 min Dykes does tremendous work to beat his marker and squares to Dobbie but couldn`t get enough on it and Mehmet collects. 4 min Thomas turns his marker but his first time lands wide. 4 min Queens win a corner. 5 min Thomas` corner finds Brownlie at the back post but his header is saved by Mehmet. Great chance. 10 min The Queens fans were already on their feet clapping legend Derek Lyle on the 9th minute. On the park Dykes taps home to make it 1-0. 13 min McMullan`s delivery from the left is collected by Leighfield. 16 min United free-kick as Mikkelsen is brought down. 17 min Fordyce nods the danger away for a corner. 18 min Another corner for the visitors. 18 min Mohsni`s high foot hits Fordyce in the box, free-kick to Queens. 19 min Dobbie uses his magic to beat two defenders but his shot is palmed away by the keeper. 21 min Good work by Dykes opens the ball up to Jacobs but his shot can`t trouble Mehmet. Good start from the Doonhamers. 28 min McDonald tries his luck from distance but flashes wide. 35 min King fires over from 25 yards. 49 min United started the stronger and win a corner. 50 min Dobbie`s effort is saved by Mehmet. 57 min Thomson fires over. 60 min Dobbie`s shot flashes past the post. 71 min McDonald`s shot is deflected out for a corner. 72 min Free-kick to Dundee United. 73 min Fraser fires the free-kick over the bar. 77 min Goal of the season there from the youngster with his first involvement. What a goal. 78 min `We want Lyle` chants from the Palmerston faithful. 79 min Here he comes. 82 min McDonald`s effort hits the crossbar. United corner. 82 min Sorry not a United corner. 90+2 min Mohsni heads over. 90+4 min Murdoch booked for a foul on Mercer. 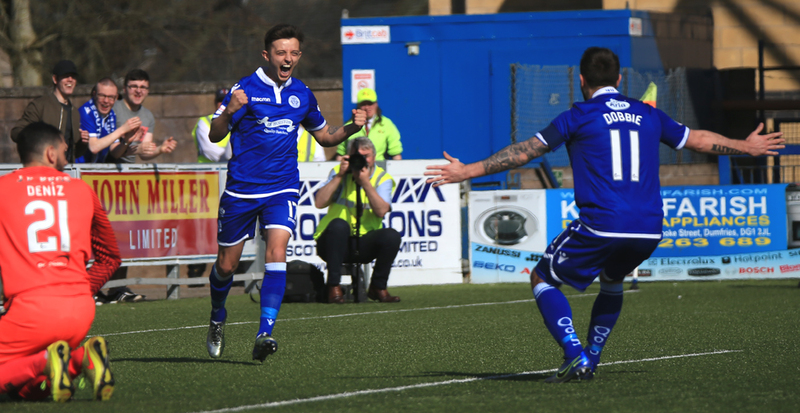 16:49 Queens end their home campaign with a convincing 3-0 victory over Dundee United. 16:50 It`s an emotional goodbye for Derek Lyle after a superb career at the club. Supporters on their feet showing their respect for the Tan Man.